History and infrastructure nerds rejoice! 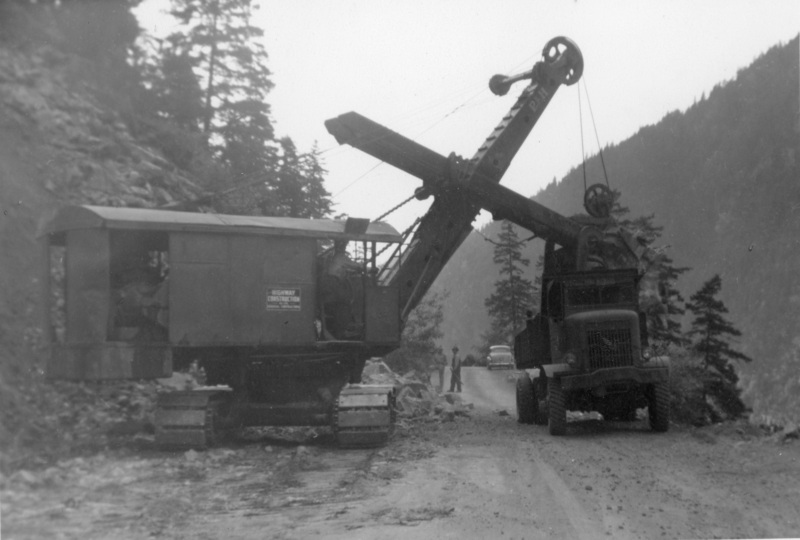 We’ve collected a stunning group of photographs documenting the construction of the Fraser Canyon Highway beginning in the 1920s, and moving into the 30s, 40s and 50s. 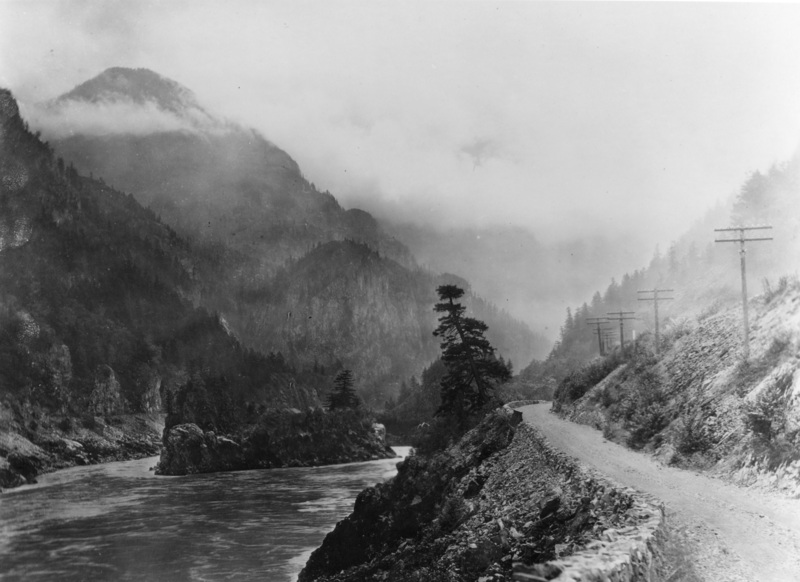 We’re excited to share them with you here, along with a bit of Fraser Canyon route history to boot. Why all the Fuss about the Fraser Canyon? 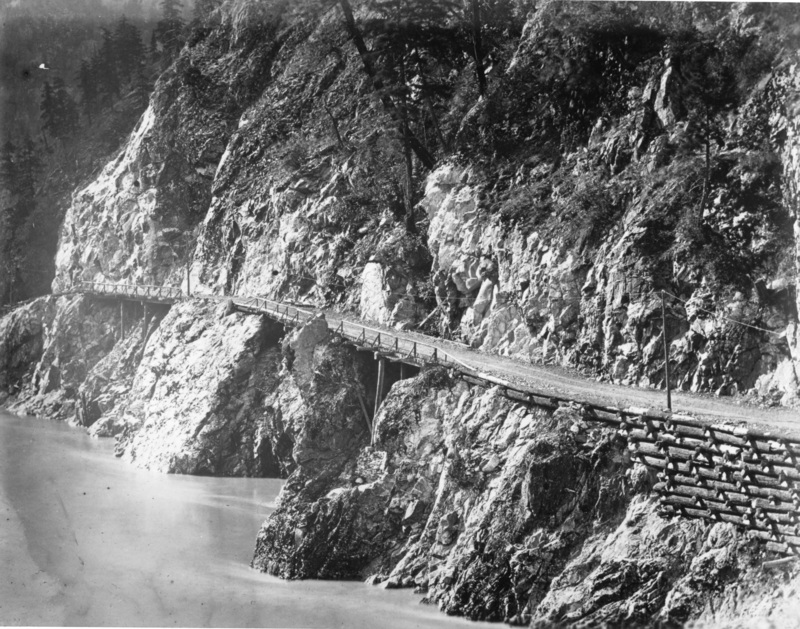 The Fraser Canyon was home to the first gold rush traffic in BC, which began in 1857 when gold was found on the banks of the Thompson River, north of where the town of Lytton is located today. When news of the “New El Dorado” in the north made it south to San Francisco, the rush was on. Thousands upon thousands of prospectors came to the area in an attempt to strike it rich. Most arrived by boat at Yale near the start of the Fraser Canyon, but the rest of the journey was by foot or wagon on the Cariboo Trail. As prospectors spread out and settled into the country, the wagon trail became an important route for supplies of all sorts. The Yale Cariboo Wagon Road became the preferred route for stage coaches and freight wagon companies and was widened and improved in many areas to keep good moving. New communities along the route also sprang to life at this time: Yale, Hell’s Gate, Boston Bar, Lytton and Clinton to name a few. 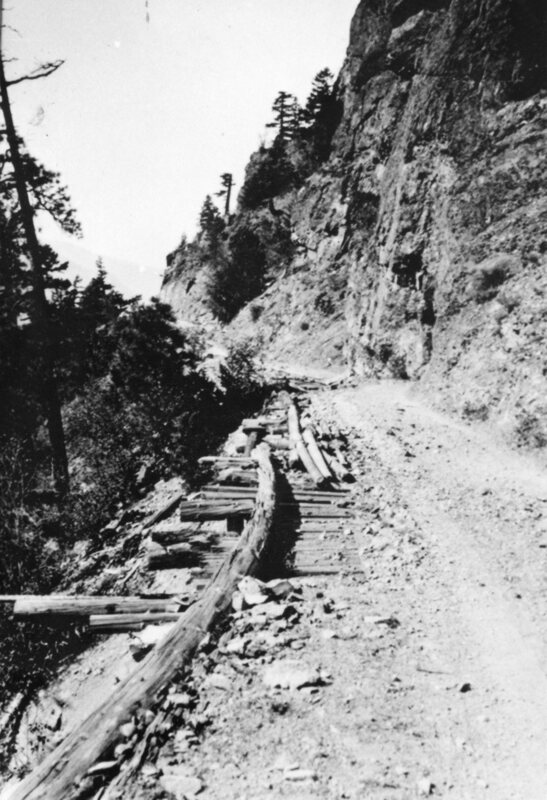 A rough section of washed out road along the old Cariboo Wagon Trail. 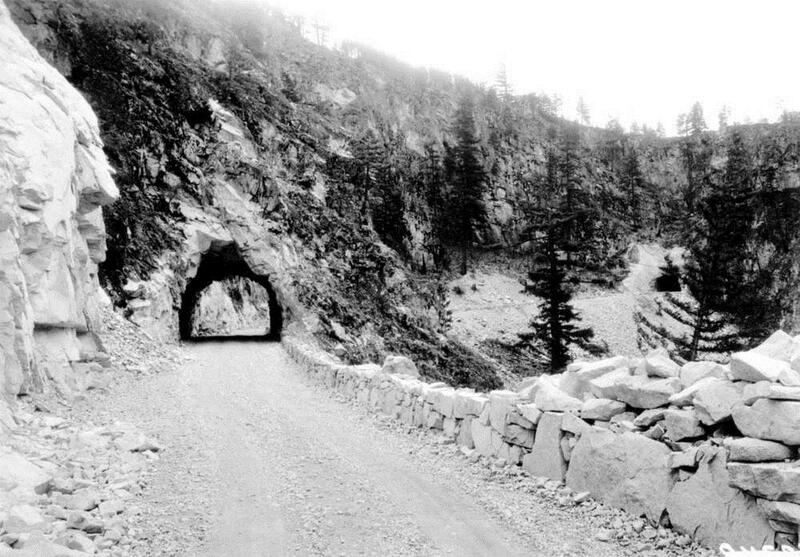 After the gold rush (and the construction of the Canadian Pacific Railway through the canyon) the Yale – Cariboo Wagon Road was largely destroyed and abandoned; however, the automobile craze of the 1920s generated a renewed interest in the route and so, between 1924 and 1939, the Fraser Canyon route was reborn as the Fraser Canyon Highway. 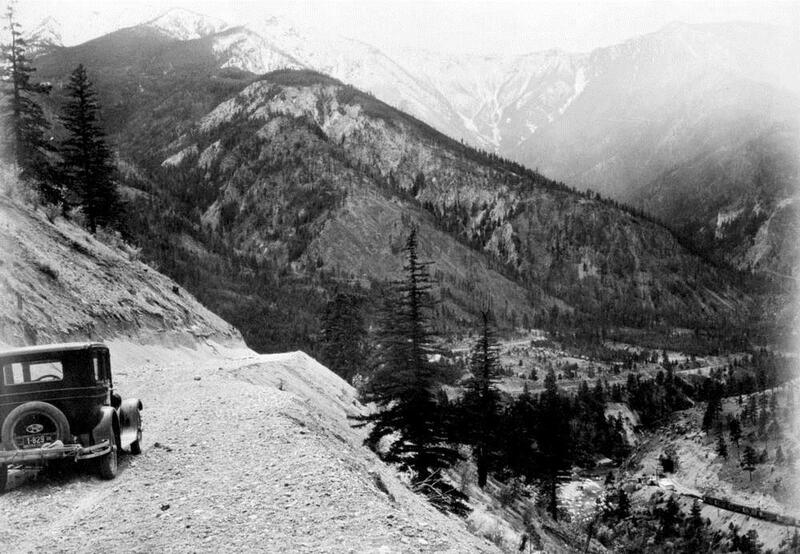 The rugged canyon and the roads carved into the mountainside gave the motoring public quite the thrill and in 1962 this section of highway was officially designated as BC Highway 1 (part of the Trans-Canada Highway). We continue to work on improving safety along this famous route for the travellers of today and tomorrow. Have a look at the photos of the reconstruction below and let us know what you think. If you have any comments about this, or any other work we do, we’d love to hear from you! 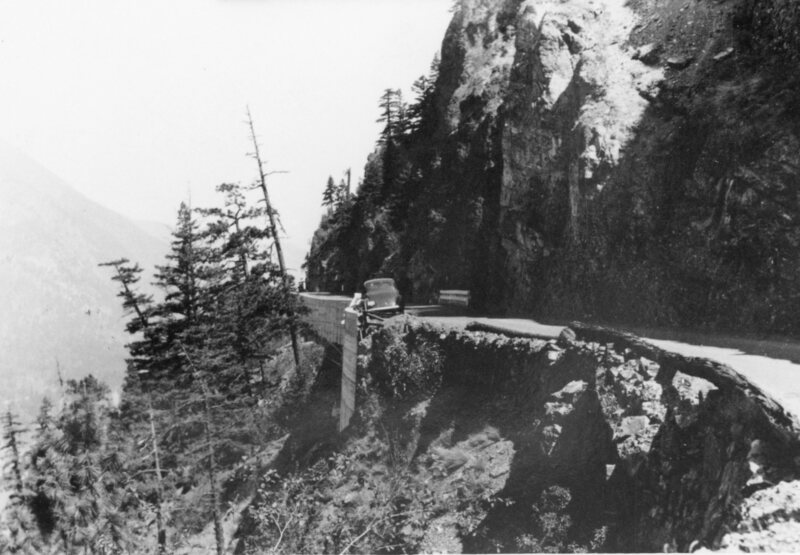 Engineers used cribbing and cantilevered roads to make up for lack of space alongside the mountains. Construction crews near Boston Bar carve out the roadway. Clearing rubble and timber to make way for the improved route. 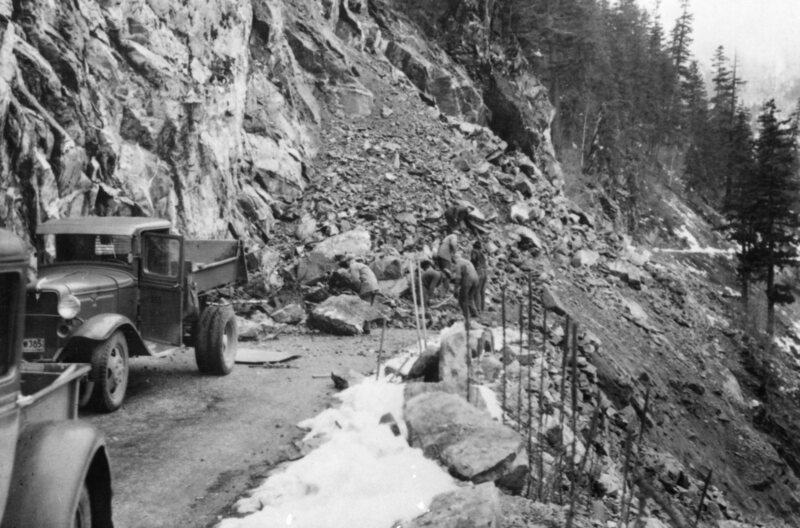 Widening the road near Jackass Mountain, circa 1939. Why Jackass Mountain? 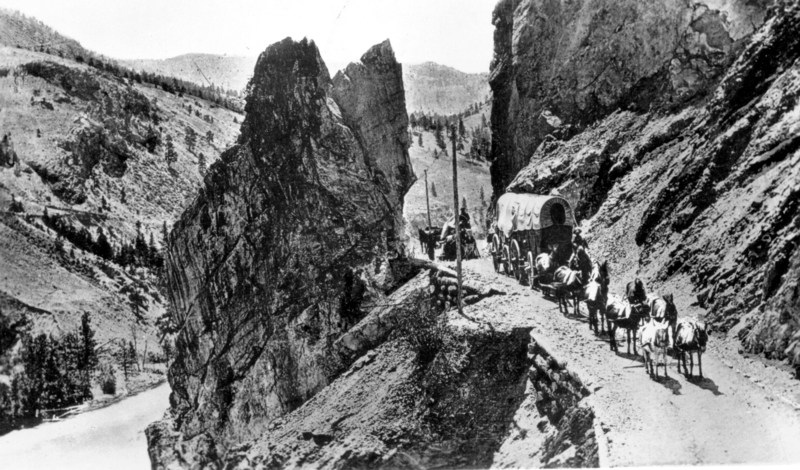 During the gold rush, mule trains often took miners and supplies north to the gold fields of the Cariboo, but not all mules made the route, instead falling off the steep bluffs, hence the name. Too close for comfort. Engineers have built many safety features to keep motorists safe along the route. Sometimes, going through the mountain was the easiest option! A pleasure drive for the “modern day” motorist of the 1920s. What a view! An early motorist is rewarded with the sight of the stunning Fraser Canyon. 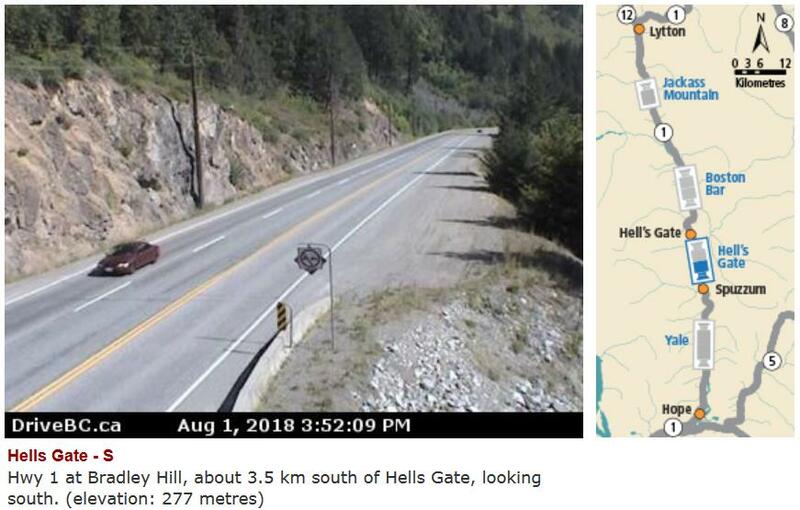 The Fraser Canyon route today, monitored by our BC HighwayCams and the DriveBC traveller information system. these photos are amazing!my great gramps worked with Cataline mule packing up the trail during 1890’s up to 1912. Then they packed north to Hazelton and into the Yukon from Ashcroft and Dog Creek.Leons Station roadhouse south of Big Bar on the old miners trail up the east side of the Fraser was great great gramps.That was during the gold rush era of 1858-62.We are Secwépemc nation from Big Bar too. In the fifties and sixties I worked on eleven bridges in the Fraser highway system. From the north at nine mile creek to the Willington overpass in the south. This included the Transmountain pipeline crossing at Flood near Hope. In between bridge building I did a lot of work in Boston Bar for Cog Harrington and others. I built the hotel addition first, then remodeled the Shell station. After that project I built a food drive inn. and a three story home, etc. These are great pictures, It didn’t have a shot of the overhanging tressels a Spuzzum. Maybe someone has some to add to this. Well done. Thanks, Dale. Hello Dale and thanks for your message. We love hearing from folks who had a hand in helping build BC highways – thank you for your work and for taking the time to share with us! in 1947 my mom,dad and brother travelled vancouver to kelowna via the fraser canyon and kamloops in dads 1934 olds. trip took 3 days with stops in chilliwack and a cabin around alexandra (still there), road rough, winding, narrow and at times single lane. weather and mechanical problems made this trip a real adventure for two young boys, but fun//. My MA Thesis at UBC Geography was an Historical Geography of the Trucking Industry in BC. It started in 1920. And much of the story was the ‘progress’ of road building. With improved roads came improved times. That and the technological development of trucks (with many local stories) are what brought the province together, not the least, as consumers. The story of the Fraser Canyon rears large in this story. Thanks for the photos. Thank you for sharing this with us Rhys. 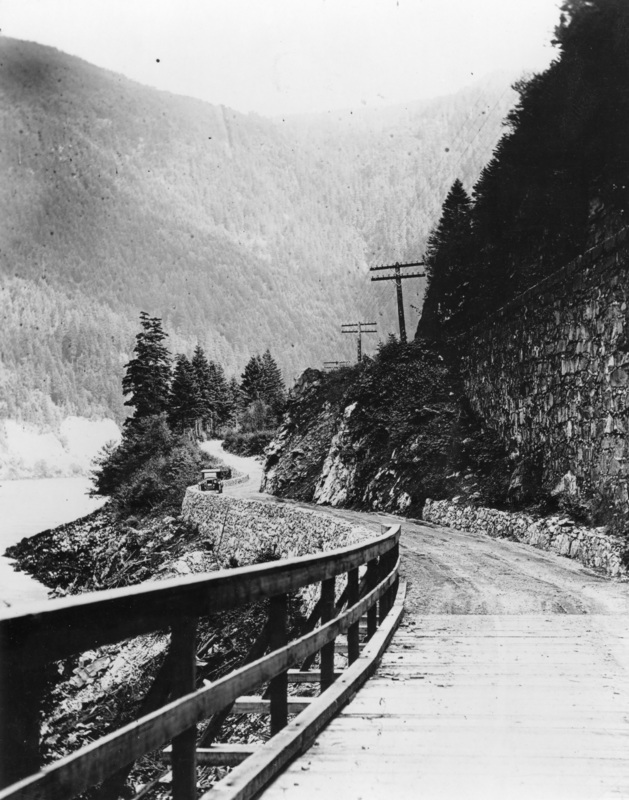 The history and evolution of our provincial roads is a fascinating story, isn’t it? Thanks for being so kind to share your Thesis! I first road on the canyon Hwy in 1948 when my folks purchased a Motel in Lytton and watched Jackass mountain being widened in 1949. As I remember the road was narrow and winding through out but was paved from Hope to Kamloops. Some of that road is still there. the second Alexander Bridge was A steel deck the first washed out in high spring water. Cachcreek was nonexistant in the 50’s. But the Ashcroft Manor was in there as well as a lot of historic buildings are still in existence. This road on the average claimed a yearly average of one fatality a year to the Hope- Princton of Three in the first year of operation upon opening in 1953 as a through route summer travel only. Where as the Fraser Canyon route was all year. We’ve decided to add you as an honourary member to our transportation history team Ian – you have so much history knowledge! Thanks for sharing this with us. I have travelled back and forth on that highway from Langley to 100 Mile House visiting my Dad’s family. I have akways been in awe at the beautiful scenery. I was never fond of travelling on it in the wintertime, too scary for me. These photos are awesome. Thanks for sharing them with us. Brings back great memories. Hello Terri and thanks for sharing your memories here with us! 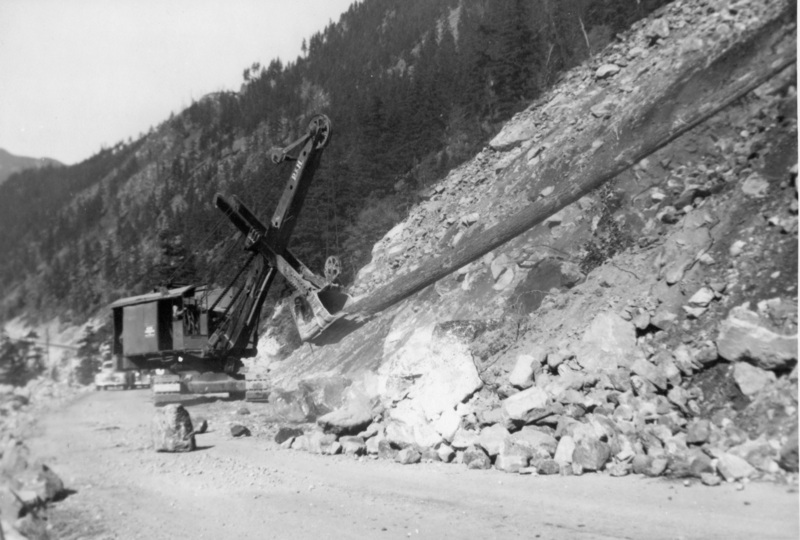 My first experience of the Fraser Canyon was from the train trip Montreal to Vancouver this was in 1956.This was a fantastic thing to see for a Dutch teenager coming to this beautiful country.Seeing all the construction going on. My father worked on all of the present day tunnels in the 60’s. He was a drill doctor…..sharpening drill bits. For a young kid it was a pretty scary ride way back in the day. Thanks for the photos and information! We are happy to share these kinds of things with you Sharon. Glad to hear you enjoyed them. Take care. My grandfather told me what the road was like back in the 30s and 40s. And I remember hearing all about the one lane cantilever bridges. In 1968 I was on a train coming back from Winnipeg, and because the highway is mainly on the other side from the tracks, I could see all sorts of wrecks that were down the slope from the road. I wonder if they’re still there. As it is, now I drive a semi on that route every day. It’s a drivers road, and I curse when the Coq is a mess and all the morons use my road instead. Wow Rob! What an amazing visual. They might have been cleaned up by now, but we wonder if anyone else has seen this? It is a beautiful drive to be sure and many drivers do prefer it over the Coquihalla. Thanks for sharing! My dad shot 16mm for the CBC of the construction and re opening of the hiway in around 1939, apparently they deleted all the credits, I’ve never seen the movie, however my dad told me about it. The CBC should still have it in there archives, and I would love to see it. Has anyone viewed it it would be nice to know, he did mention a streach of the road that they touted as the million dollar mile. Sounds like it would be great footage to see Dave – thanks for letting us know. We will have a look! Our family moved from the interior to Surrey in 1944 and traveled this route. I was 11 at the time and remember it being very scary. Dad assured us that it would be fine when we reached Hope and had us looking forward to the new Patullo Bridge. Having graduated from high school in Saanich spring of 1953 two of us traveled the canyon on our way to Smithers in late July that year. George v’s Model”A” Ford got us there but not before we experienced the cantilevered bridges?? no railings; very rough gravel/mostly crushed sharp rock road surfaces and NARROW portions with limited vision around the curves. Often we expressed concern to each other about on-coming- traffic and on several occasions were required to stop and reverse to wider (inside) pull-out to allow south bound vehicles to pass safely. As I recall these were often larger and more modern transports! We broke a gas line feed to the carburator just north of Spences Bridge and limped into Cache Creek just over 8 hours after leaving Hope. We were 4 days to Telkwa where we found work. At my present age 83 this is one adventure often relived. Thanks for the reminders!!!! Wow Donald – thanks for sharing your memories with us here. Yes, the road has certainly changed since then, and this kind of story helps illustrate how far we have come! I remember driving through the Canyon in 1940 with my Mother and Dad when I was 11 years old. We were on our way to Chute Lake, between Penticton and Kelowna. The drive through the canyon was pretty scary because of the many narrow sections, switch -backs, tunnels etc. In those days we had many flat tires because of the gravel roads and of course the tires had tubes. Changing a tire was quite a chore, especially when you were parked on a narrow section of road. BUT, the scenery was marvelous. Great memories. My family and I travelled the Fraser Canyon in 1948, and at six years of age I can still remember the corduroy roads and very slow travel. It was something to behold really. My long term memory is very good and I can still visualize it to this day. Hi Harold – we are so glad to hear you enjoyed it. Thanks for sharing your memories with us! Thank you for this beautiful memory. I remember my first trip on this highway. It was 1940, and we drove from Princeton up through Spence’s Bridge to join this route. It was 313 miles, and two days, from Princeton to Vancouver then, shortened to 183 miles when the Hope-Princeton opened in November 1949. We did the trip west in a 1929 Chevy, and drove a brand new 1940 Oldsmobile back on its maiden voyage. Being a B,.C. history buff, this site is more than welcome. Growing up near Trail, I remember the twrrible switch backs that went through WA Sate to get to the coast. I would like to see the construction that went on to build Hwy 3 if you have it on file. Hi Vic – thanks for your support! We will look for Highway 3 construction and share what we find! BTW Are these photos part of the ministry’s collection? “collection” is a nice term. 🙂 More photos we’re finding as we come across them. Thanks for sharing these archive photos! I enjoyed seeing the progression and knowing more about why that road is there. Very impressive that you have photographs of the very early stages of the Fraser canyon in your archives and that you post them. Our family came up to Williams Lake in 1958 and still remember some old trestles and hand built walls and waiting for tunnel blasting and road crews to do there work. How times have changed,from a 11 hour or 12 depending on work being done to 6 or 7 hrs depending where your destination is, keep up the good work. Glenn Lambe Wms Lake. Thanks for sharing your memories of the Fraser Canyon with us. Times certainly have changed! What an amazing album! The historical info is very intriguing. Thank you for sharing with us! Glad you enjoyed it, Terry!